The expanding use of both social media sites and mobile websites affects businesses at a basic level. If you believe social media does not play a role in success, then your competitors are already ahead of you. In fact, the Fortune 100 companies garner over 10 million mentions a month on the Internet, with over 5 million mentions coming in the form of “tweets” from social website Twitter, according to PR firm Burson-Marstellar. The massive number of mentions from Twitter is hardly surprising considering the rapid expansion of social media. Twitter itself grew 700 percent in the last two years. For auto repair companies, harnessing the potentials of social media sites allows businesses to gain an edge over the competition, improve marketing techniques, and fulfill customer demands in a timely manner. Provide videos that focus on auto issues such as common automobile problems, do-it-yourself repair techniques, and so much more. Develop auto-based apps for mobile devices. Provide expert, first-hand information about car maintenance and repair by providing links to online manuals and useful websites, and contribute information that isn’t available by your company. Communicate with prospective and current customers to create personalized, trusted business relationships. Showcase reviews of the company. Increase brand recognition among consumers. Social media drives word-of-mouth recommendations and will be an important influence on your customers. Stay current by adapting for the future with Digital Marketing Sapiens . 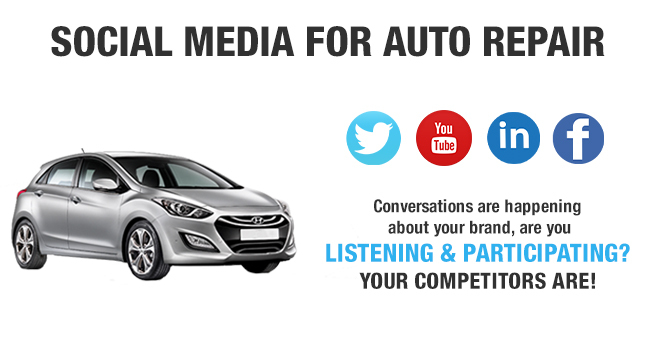 Let us help you create and implement a personalized social media strategy for your auto repair company.